Computer Comforts, Inc. is Proud to be a FLEXspace Gold Partner! We’re Celebrating our 30 Year Anniversary! Who is Computer Comforts, Inc? 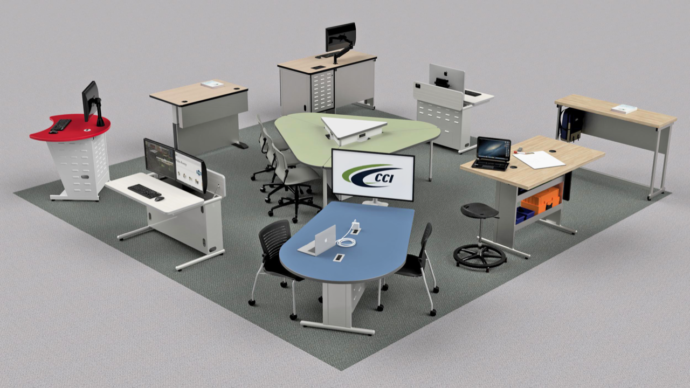 Computer Comforts designs and manufactures furniture for a wide variety of learning environments. We are the ONLY manufacturer that focuses exclusively on the Education Market. For a brief overview, flip through the slideshow provided below. This presentation was given at a recent Educause ELI Conference. The Sol Messinger Active Learning Center at the University at Buffalo Jacobs School of Medicine and Biomedical Sciences represents a major change in teaching and learning for medical school students and faculty at the University at Buffalo. The Active Learning Center planning process incorporated multiple iterations of pre-planning, design, and consultation with architects, technology and furniture consultants. AdapTables Fixed Legs from Computer Comforts on Vimeo. See our 2018 Digital Catalog for the latest furniture designs for high-tech learning environments.